A 'second reformation' in global theology is currently taking place. In the Majority World evangelical theological education is growing rapidly and increasing its global impact. Scholars are applying the fruits of their research in Biblical and theological fields to their contexts to serve the needs of theological students and churches and their leaders. One of the most significant trends within this growth of global theological education is the increasing emergence of evangelical doctoral programs. Starting with a major consultation in Beirut in 2010, ICETE's Doctoral Initiative has been working to provide resources to develop and equip these programs. This book contains the results of that work, including the Beirut Benchmarks for Research Doctoral Programs (2010), the Beirut Benchmarks for Professional Doctorates (2011), and a well-developed series of statements on best practices, which explain, amplify, and help apply the Benchmarks. Written out of a commitment to excellence, and a belief that such excellence is honouring to God, and of service to His Church, this work will benefit doctoral programs, students and supervisors working both in the Majority World and the West. 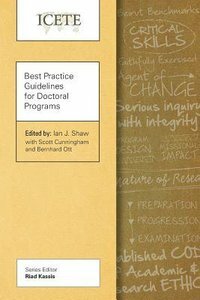 About "Best Practice Guidelines For Doctoral Programs (Icete Series)"